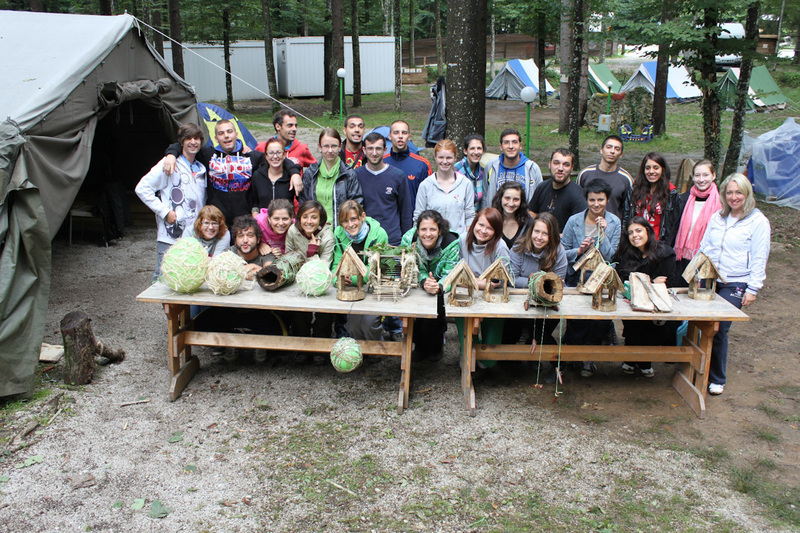 The multilateral youth exchange “e-Nature II” is a project within the Youth in Action program which promotes healthy lifestyle and living in the nature. The ecology is the main theme of the project that will connect people interested in healthy lifestyle and preserving the nature. The main purpose is to spread awareness about environmental concerns while personally making an impact. Considering the local and global aspects with the lecture given by the experts, participants will explore nature and connect their real life which goes hand in hand with man and nature-friendly and healthy lifestyle. For example many of the regular items people use every day can be improved to be reusable and reduce waste. 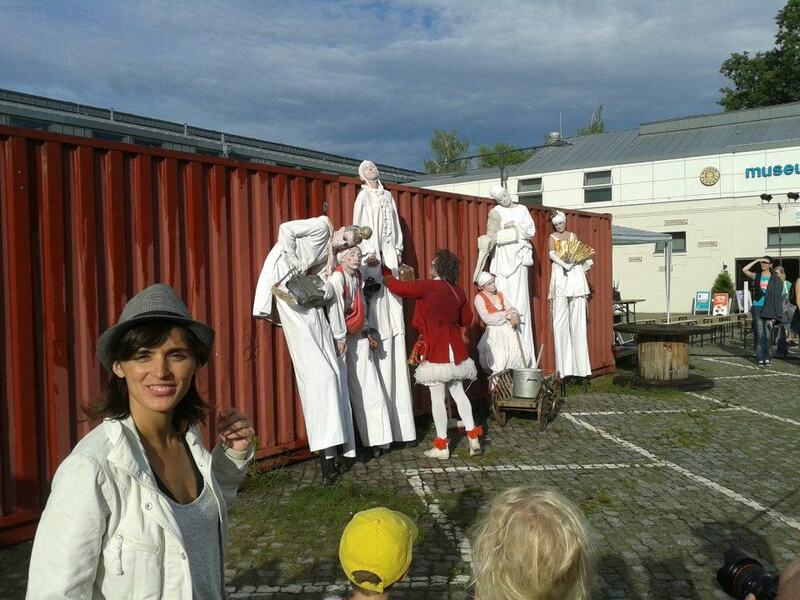 For instance, participants will try to make homemade "eco sculptures" with collected materials from surrounding area. We are planning excursions around the mountains and forest to collect data about current environmental worries and to enjoy place with fresh mountain air. The nice summer weather will be used as an advantage and opportunity to bike short distances, rather than taking the car. Trips to the town and other surrounding places will be part of activities. We will include many experts in the project who will prepare workshops, lectures and tips to teach the next generation about sustainability and green living. By the end of the project and after, participants will present their awareness on most innovative way they can provide. Perhaps the best way to spread awareness is to take advantage of all the social networking sites which are so prevalent today. Through mediums as simple as a Facebook status, hundreds of people can take note of what others are doing and be inspired to participate as well in future projects. Using theatre methods in youth work is aimed to understand the complex dynamics of social coherences with their different interests and points of view and to give the opportunity to develop new possible courses of action. These kinds of tools provide a forum for resolving conflicts among people with different views. They are effective in clarifying values, developing social skills, solving problems, developing and rehearsing action plans or improving personal effectiveness and awareness providing us with an opportunity to step into the shoes of the "Other" and explore the situation from the "Other's" perspective. Furthermore they draw on people's experiences, are relevant to their concerns, engage people in the learning process and follow the learning cycle of people being involved in a learning experience, which they have time to reflect and theorise upon afterwards before planning new actions. Merging theatre and youth work, the results can be very fruitful since theatre methods are particularly useful in a situation that includes of people with diverse backgrounds, customs, beliefs and attitudes. Within youth work as such theatre can be used to create a unified group, encouraging interactions between individuals who may differ in ethnicity, gender, age, religion, learning style and socio-economic status. Hence, based on the play “The races” by Ferdinand Bruckner (a play in three acts, 1933) the training is aimed to strengthen the capacities of youth works in the field of anti-discrimination work. It will be designed as an intensive one for youth leaders focusing on three main areas as (1) deepening the content of anti- discrimination youth work, (2) learning new methods (usage of theatre tools) and (3) practical use of learnt methods (how to run youth projects on local and European level fighting exclusion, discrimination and racism). Furthermore the training will offer time and space to organisations to exchange and to discuss their working experiences and strategies which approaches and methods are appropriate to motivate and to include young people. In a third step it needs capacities of those involved about the practical use of learnt methods, namely how to run youth projects on local and European level fighting exclusion, discrimination and racism. This seven-day training course, taking place in Bakuriani, Georgia, from 26 June until 4th July, 2012, will gather 32 youth NGOs workers, youth leaders, youth workers and active young people from 8 country: UK, Georgia, Poland, Moldova, Ukraine, Czech Republic, Estonia, Azerbaijan. Youth participation and active involvement of young people in local and regional life are one of the key concerns in the European integration process. "Discover the Power to Act - A Practical Guide for Youth Participation" originated from a need for young people to take a more active role in society. In the current period of austerity, job losses, high unemployment and increasing social issues across Europe, it is vital that young people are not lost in this time of uncertainty. Therefore this project aims to instill a sense of responsibility, belonging and direction for young people and to empower their engagement with democratic processes. This will be achieved through empowering active youth leaders, young people and youth workers by bringing these people together and offering a platform for debate, discussion and creativity. Empowering these people is the first step to tackling the core issues of this project of youth participation. 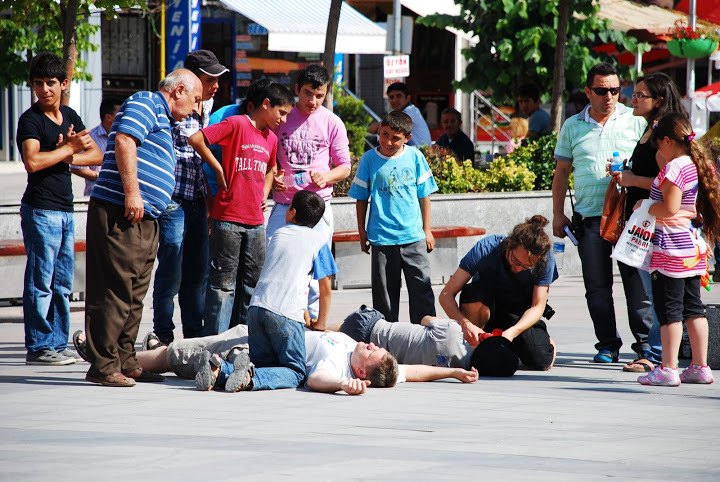 The training course “A B C of First Aid” is designed as a process of non-formal learning and peer education involving participants from different countries who work with young people, have experience in the fields of youth work and who are eager to learn about the basics of First Aid. Participants are required to have an active input in sharing knowledge and experience, and to be willing to learn new skills, in First Aid and intercultural youth work, from the trainers and each other. This active participation will encourage ownership of the learning, motivation and comittment to working together, building effective international working relationships, making the training an exercise in best practice. Youth exchange in Poland brought together 42 young people from Estonia, Poland and Bulgaria to find ways how to keep healthy and use sport as a mean to do it. Several workshops, field trips, discussions and sport activities took place in the framework of the project. Youth exchange "Right To The Game!" brought together participants form Estonia, Italy, Romania, Poland and Hungary from 5th to 13th May 2012 in Portici (Napoli) to discuss topics connected to fundamental rights of European Union. Estonian participants were: Lisandra, Liina, Helen and Kadri. APV was attended by Heleri. Seminar "Empleate A Fondo!" 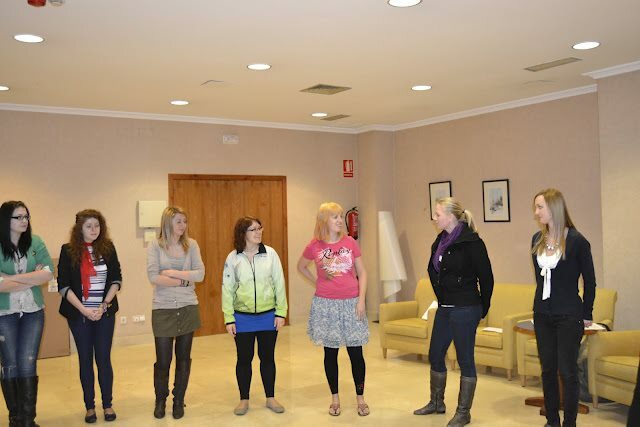 brought together youth workers from different European countries to Santiago De Compostela, in Spain. One of the biggest problems of the young people in Europe is unemployment; the rate in Spain is up 40% among youth. The goal of the seminar was to know more about this problem, to know what has happened and try to find solutions. Participants shared ideas, debated with politicians and thought what they could do to change the situation. Seminar had special focus on the European mobility programs and their future after 2013. Seminar also created space to create new youth projects in the framework of Youth in Action. Seiklejate Vennaskond was represented by Heleri and Siiri. From 14th to 19th February preparatory meeting in Bhubaneswar, India was held. 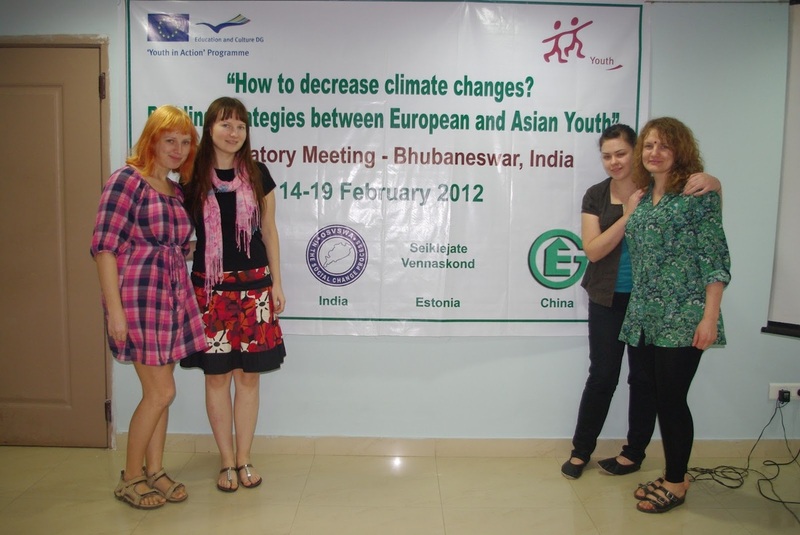 16 youth leaders, youth workers and members of environmental NGOs from Estonia, Portugal, India and China participated. The idea was to debate on climate change and together find solutions how young people could contribute to sustainable development. Four campaigns in participating countries were developed and will put into practice with the help of young volunteers. The aim is to find solutions to decrease the effects of climate change and raise the awareness about the problems locally, regionally and globally. Even through some countries are affected less and some more, the climate change is something which can and will affect all future generations. Every single person has a chance to give a small effort to change the situation for better - it can be something small like using cloth bags or something big - like starting volunteering project in environmental NGO abroad - but everyone can do something. Together we can make the world a better place to live in! 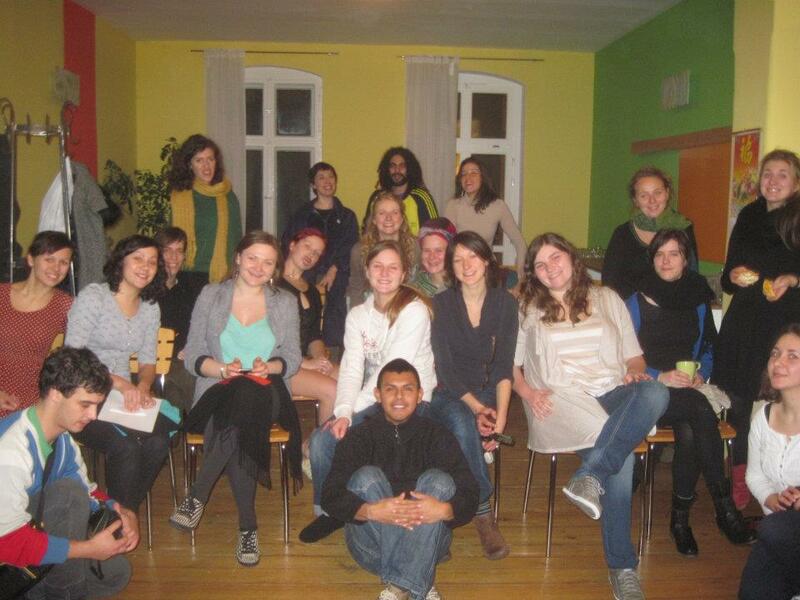 Seven Wonders of Youth is Youth in Action Programme 1.1 Youth Exchange project. Youth exchange was done in order to reflect the importance of international values by observing and evaluating works of art related to that values which are created in different countries. Peace, liberty, respect, equality, tolerance, justice and solidarity are values that should be conserved by all human beings in the world. In order to analyze how these values are perceived and reflected, we have chosen works of art since art is a common language of whole world. Seven Wonders of Youth is a seven day activity (Youth Exchange) with 40 participants from different countries. (Switzerland, Turkey, Italy, Hungary. United Kingdom, Romania, Estonia). Estonian participants: Tambet, Triin, Marta, Stella and Aet. The training schedule follows the idea to include all participants as much as possible and to open space for interchanging of their own experience with other youth workers, active in the same field and with the similar target group. After the introducing sessions (including ice-breaking, name and getting to know each other games), the schedule, objectives and aims are presented to all. Trainers and facilitators will endeavor to establish the co-operating environment and trustful basis for the theatre work. After that the group agreement will be set down and needs, expectations, motivations and potential contributions of participants will be assessed. In the following days, learning as planned consists of three levels: (1) deepening the content of anti-discrimination youth work, (2) learning new methods (usage of theatre) and (3) practical use of learnt methods, adapted to the main topic. The first set of sessions aims to gather the challenges youth workers meet on the national level while spreading anti-discrimination ideas among youngsters. While exposing former cases, they will have the opportunity to reflect them directly on the spot with other youth workers and beside, to obtain new knowledge, how to deal with the theme. This session is meant to be a brainstorming and inspiring introduction and presentation how later on the topics, they deal with, can be transformed into the theatre means of the expression. Secondly, participants will obtain the principles, how does theater work and influence the audience, including exercises, how to use muscular, sensor, memory, imagination and emotion skills for self-expression and communication with society. The trainers will give the first inputs and key terms about usage of theatre methods for the social changes. In the continuation they will get familiar with the (1) usage of different body means, (2) connection between actor, message and the audience, (3) definition of the target group. Due to the needs of anti-discrimination work with youth, participants will become conversant with two particular methods, "invisible theatre" and "newspaper theatre". They will learn how they can be applied into their daily work. Both methods were invented by the work for social changes and the “theatre of the oppressed” in Brazilian society of1960'. We will provide the broad overview on this theatre work. On the third level, their own proposals and idea for the "invisible" street intervention will be developed. Experience of self-creating such action will come to a greater meaning in their later work with youth, to lead and direct them in similar efforts put into anti-discrimination work. Participants will be splitted into two groups and will separatelly plan the simulation of street theatre action. Together with the trainers, they will discover the important points and emphasises of that kind of action Due to the follow-up action, we will offer time and space to develop new ideas and to form new projects in the future at the very end of thetraining. All of them will be discussed in plenary, suggestions and potential improvements will be provided by trainers and facilitator. to participate as active citizens in the Youth in Action Program. 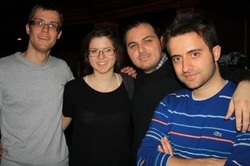 Partners of project were: Greece, Romania, Portugal, Estonia and Spain. Estonia was represented by: Maria, Karina, Elo, Lisette, Mari, Liisa, Viktoria and Grete.